This rotational molder is known worldwide for manufacturing extremely durable products that have incredibly long life expectancies and are capable of handling everyday use for years and years to come. Basins, berms, and tanks are our top products. Using custom manufactured molds we can customize a solution for you. We are a dedicated manufacturer of rotomolded products. All of our solutions are very affordable and we utilized the most cutting edge technology when creating our products. If your application requires a custom solution then simply give us your specifications and we can rotomolded product that matches your needs. We do rotomolded products unlike anyone else. It is our main goals to provide efficiency and consistency in every business encounter we are a part of. Our staff has the capability as well as the know how that you can depend on to help you come up with a product that is custom designed to what you need. We have a research team that ensures that all of our processes are state of the art in order to offer an innovative product every time. Visit us on the web today! Rotomolded products are seamless, single piece plastic parts that are thin-walled and hollow. They are made from lightweight thermoplastics like polyurethane, polypropylene, nylon and polyvinyl chloride that form aluminum or steel molds to fabricate many different shapes. Rotational molded plastics are subjected to high heat and therefore must exhibit good thermal stability. Rotomolded products require no assembly and have even, smooth walls every time. Rotational moulding is an inexpensive process that fabricates high quality and durable products, but works slowly in small runs. 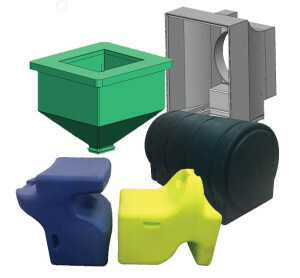 Rotomolded products are found in many different industries, including the sporting goods, marine, materials handling, packaging, office, school, recreation, toy manufacturing, medical, construction, plumbing, agricultural, automotive, promotional/display, road safety and furniture industries. 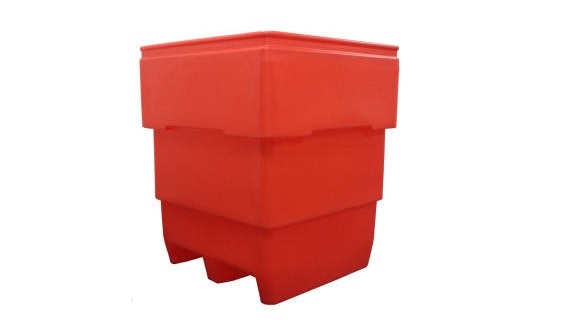 Many different containers are rotomolded, including plastic tanks, cases, packaging containers, bins and trash cans. Other products include doll parts, lawn ornaments, road cones, kayaks, playground slides, outdoor chairs, footballs, sleds, pipe fittings, hoppers and plastic planters. These products are usually medium to medium-large in size, but cannot exceed 20 feet because of machinery constraints. They are sometimes multi-wall, often hollow, and the resin can contain additives for moisture protection, flame retardancy, static elimination, color and texture. The rotational molding process is simple, but requires huge, expensive machinery that uses lots of space and needs a fully insulated walk-in oven. Specialty or stock molds are fabricated by welding or die casting and then attached to a massive, round revolver that spins and revolves on two axes simultaneously. Fine grain plastic resin powder is dumped inside the mold, which is then closed. Multiple products may be formed at one time, regardless of their shape or size difference. Each machine has two to four revolvers that hold molds. The revolvers are either enclosed in an oven or travel to a heated environment, where the process begins. They operate slowly under low pressure and high heat. Inside the molds, the plastic powder becomes molten and smoothly and evenly coats the interior walls. They are then transferred to a cooling station, where they continue to rotate and are exposed to cold water and air for about 20 minutes in order to cure. Next, the newly formed product is manually removed from the mold, which can be a difficult process. Some products need further finishing, like welding, where parts are attached, or cutting, to add openings and holes. After the plastic has been cleaned and polished, it is ready to be shipped. Rotomolded Products - Fibertech, Inc.